The means through which sports fans digest news have changed enormously since the beginning of the 21st century. It doesn’t seem like all that long ago since going to a game, watching whatever game was on TV or reading the following day’s newspaper were the only ways of finding out how your favorite team was performing. Today, these are just some of the options at your disposal, and waiting for the morning newspaper seems as outdated as a gramophone. You can find a website showing your team’s game if you can’t attend it in person or if it’s not on mainstream TV. You can check Twitter updates from your team’s channel (pretty much every major team’s feed is constantly updated) and you can check in on the latest score and roster line-ups on a live updates app. For the hockey fans amongst us, here is an infographic developed by team Tucker Hockey which identifies Top 10 Hockey Apps for Android and iOS (iPhone / iPad / iPod touch) smartphones and tablets that any lover of the sport (or even more casual fans) will surely enjoy. The selection covers not just news and score update apps, but also those apps which encourage fan interaction and some time-passing games, including the behemoth that is fantasy hockey. If you need to change your roster or make last-minute transfers while you’re on the go, the Yahoo Fantasy Hockey App is there for the switches to be made before the gameday deadline. As leading authority apps go, the NHL’s version is right up there with the best that any sporting organization can provide. Its news feed is updated constantly with comprehensive stories, while its much-renowned Game Center contains in-game highlights from every game played during the NHL season. If you miss a game and want to catch up with it afterwards, the app contains a full rerun of games. You can also customize the news feed and Game Center to give priority to content relating to your favorite team. Aside from watching hockey, fans also love talking about the sport, and a great way to do that is through apps which provide a platform for interaction through forums and chatrooms. If there’s a controversial incident or a much-debated team selection, fans can have their say through apps like Shnarped Hockey, which also features profiles from leading NHL players who post regularly. 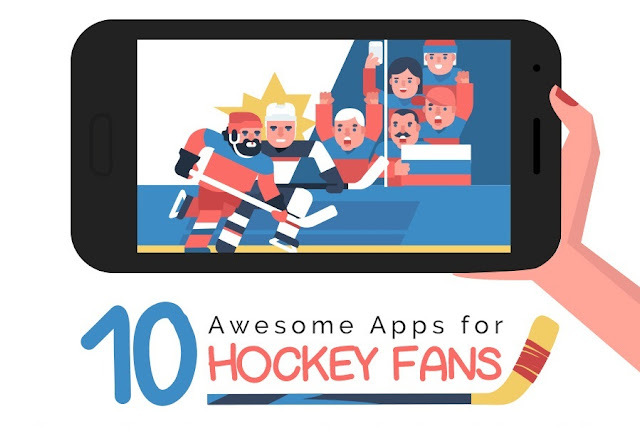 If you’re a Hockey Fan and Sports Lover who enjoys consuming online content, these mobile apps are a must-have for your collection.